Regular readers might remember hearing about a fab fat cat named Tama which was officially named Station Master at an unmanned station in the Wakayama Electric Railway in Japan. It was really popular and attracted shedloads of tourists to the station. At the time I said it was "generating a nice little earner for the Railway." That nice little earner is now estimated by experts to be 1.1 billion Yen or around 6 million quid! Japan Probe reports that on Friday, "Professor Katsuhiro Miyamoto of Kansai University Graduate School released an estimate showing that, in the one-year period since January 2007, when Tama first began "working" for the station, the number of passengers on the Kishigawa Line rose by 55,000 and that corresponding freight revenue climbed ¥15 million. Photo collections and related merchandise featuring Tama grossed ¥27 million, and he is also credited with boosting tourism in nearby Wakayama City." In the video above Tama is shown sleeping in his new office, where he is joined by two helper cats - Miko and Chibi. "Professor Miyamoto believes one of the most impressive things about Tama's economic impact was its low cost. 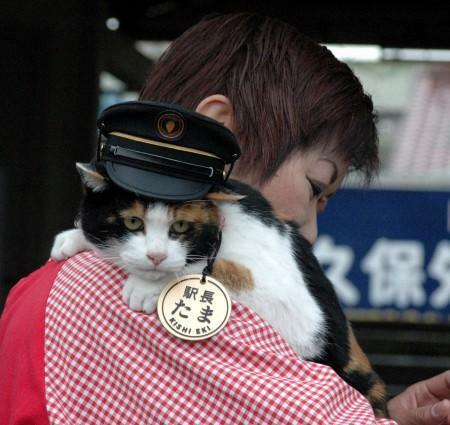 For the price of a cat-sized stationmaster hat and some cat food, the Wakayama Electric Railway has raked in a huge amount of money." Many thanks to Jon Justice for the heads up here. But this is yet another occasion where the London Underground could learn from Japan. Forget cross platform Tube ads. Forget sponsors for the Tube map. Get some cats in from some animal shelter or Battersea Dogs & Cats Home (yes, they house cats now too), get a few hats, get Purina behind it with some pet food, get them all kitted out in time for the 2012 Olympics and Bob's your uncle, instant revenue. Although this time Bob Crow and other fat cats from the transport unions would definitely get involved. The cats would have to have lessons in advanced tea drinking and be ready to stop sleeping, sorry, stop working at the drop of a hat. They're already good at ignoring humans & doing things in their own time, so no extra training would be required there. In fact we could even fly a load of cats out to Japan so they could learn the art of sleeping on the job from Tama and his mates. 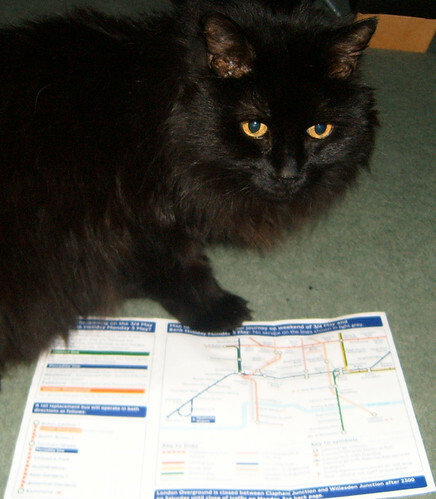 I'd be happy to volunteer Bolli for the job, as he's partial to poring over any London Underground stuff I leave lying around. For six million pounds in potential revenue it would be worth every penny!